The Zero Blaster is a new toy that encourages kids to blow smoke rings, but with a gun—not cigarettes. 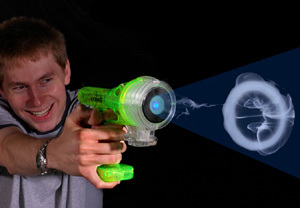 The Zero Blaster includes a light for fun at day or night and can blow the rings up to a distance of 12 feet. It requires a water-based non-toxic fuel to create the rings. At least you can't put someone's eye out with this gun, but you do encourage smoking. Oh well, gotta make sacrifices. $20 from Zero Toys.